We try really hard not to waste food in our house. It’s not always easy though. Sometimes fresh vegetables and fruits go bad faster than expected, especially in the warmer months. One thing I have found myself wasting is fresh herbs. 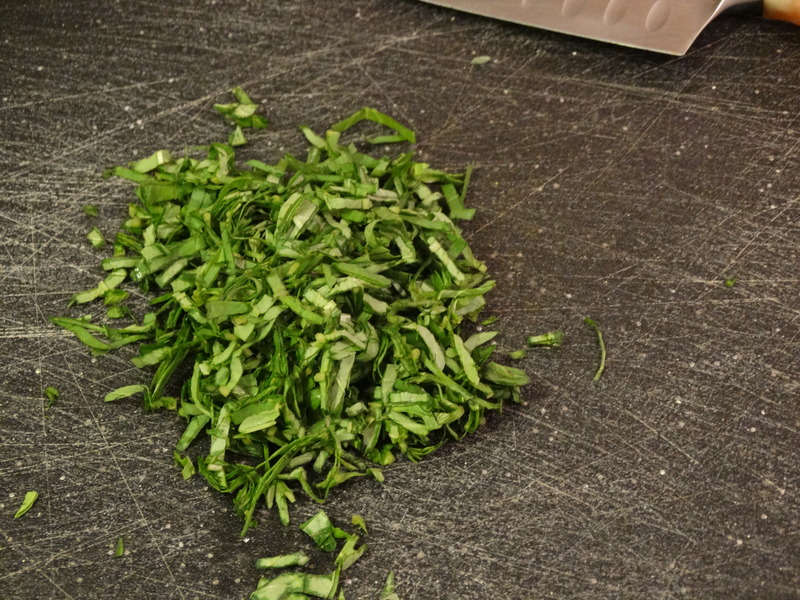 Many recipes call for a teaspoon of this or a tablespoon of that, but what about the rest of that parsley or cilantro? I’ve typically tossed it back into the refrigerator, telling myself I’ll use it for something else, only to end up throwing it away a week later when the leaves are wilted and slimy. Gross! Recently, though, I have started chopping up the entire bunch, using what I need at that moment, and freezing the rest. Above you will see some of the latest additions to our freezer: tomato paste, chili peppers, and oregano. The tomato paste was easy. I put one tablespoon of paste onto a small square of plastic wrap, wrapped it up tightly, and put it into a storage bag. The chili peppers required a lot more work. I washed them, cut off the stems, removed the ribs, and then puréed them in my mini food processor with olive oil. I used just enough oil to make a thick paste. Then I wrapped them the same way as the tomato paste. 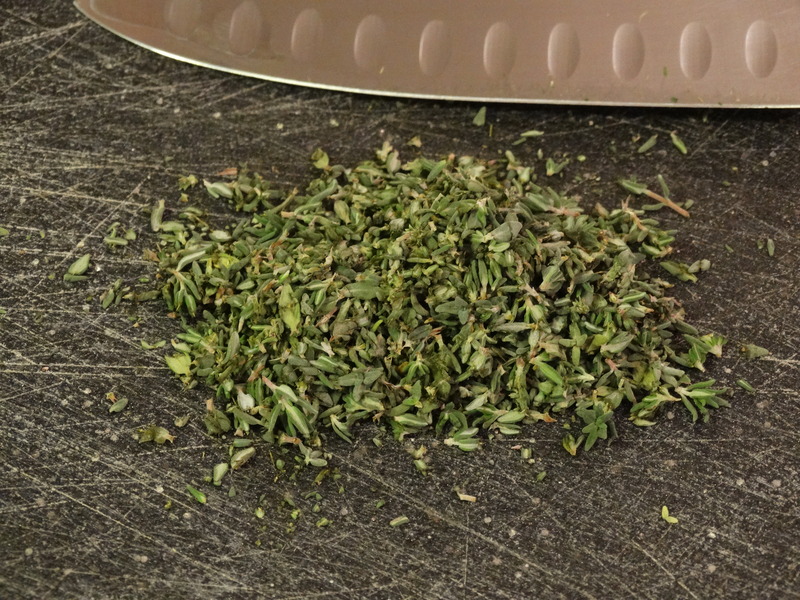 Today I stored some fresh thyme and basil using the same method I used for the frozen oregano pictured above. After washing and patting them dry, I removed the leaves from the stems. Then I finely chopped them. 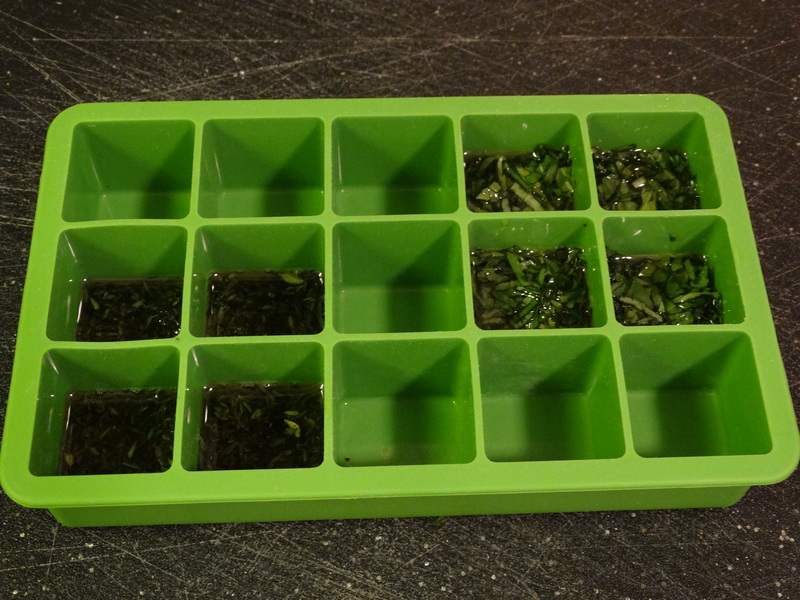 I measured out 1 teaspoon of thyme, then added it to an ice tray cube. I used a tablespoon for measuring the basil. 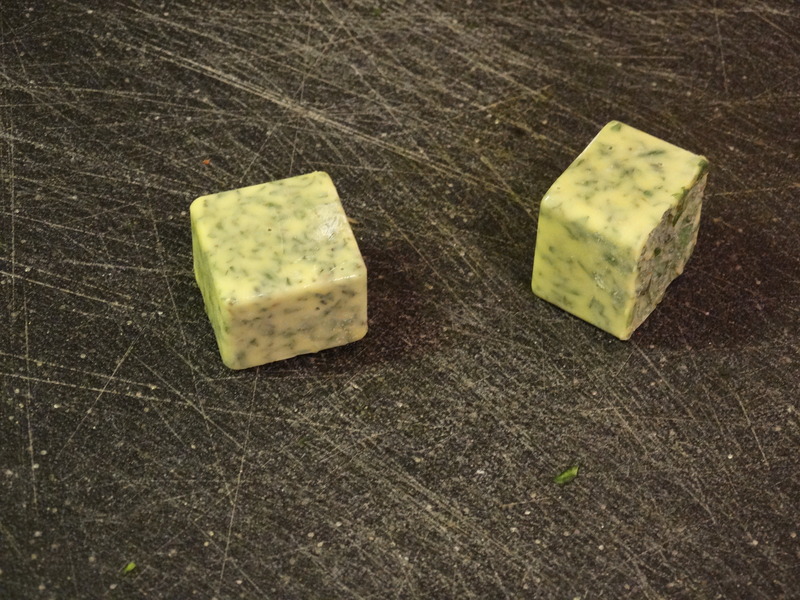 Next, I poured just enough olive oil over each square to cover the herbs. You don’t need to fill the entire ice cube space with oil. 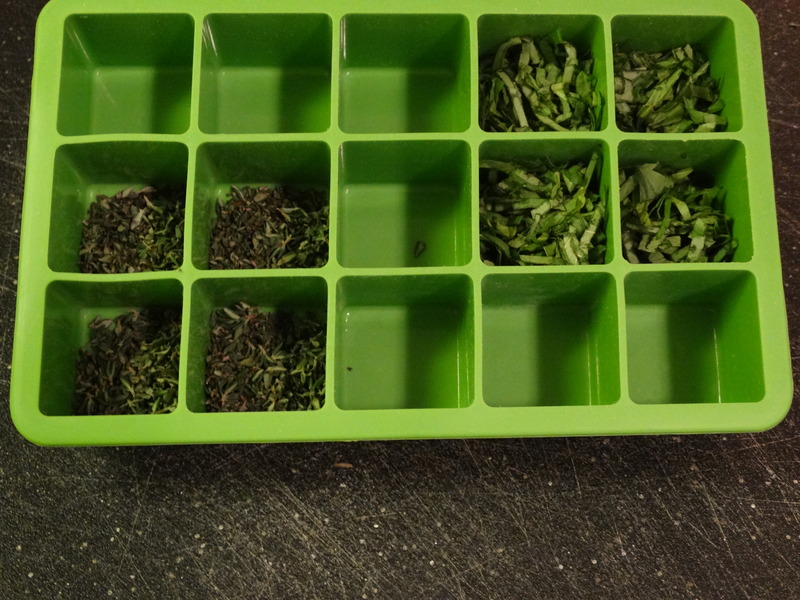 Put the tray into the freezer and once frozen, you’ll have portioned herbs for your next recipe! 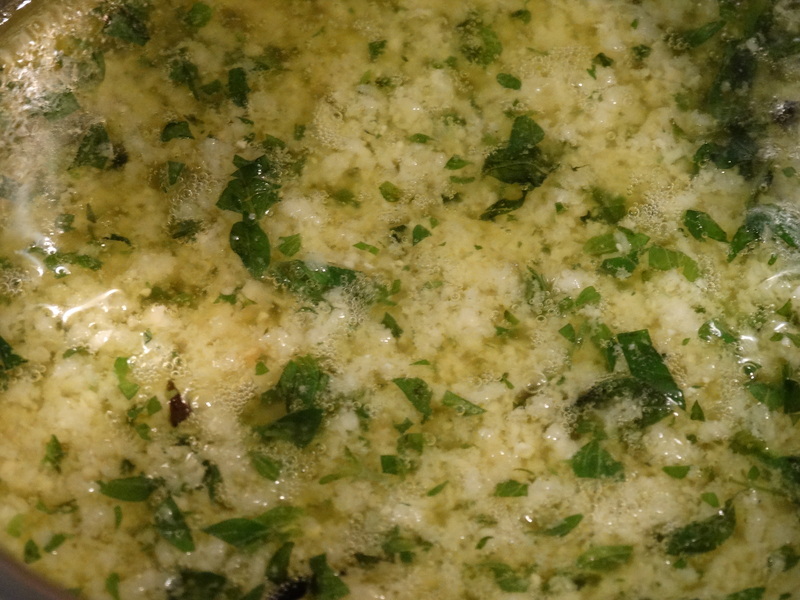 I recently used one of my oregano squares to make some garlic butter for bread. 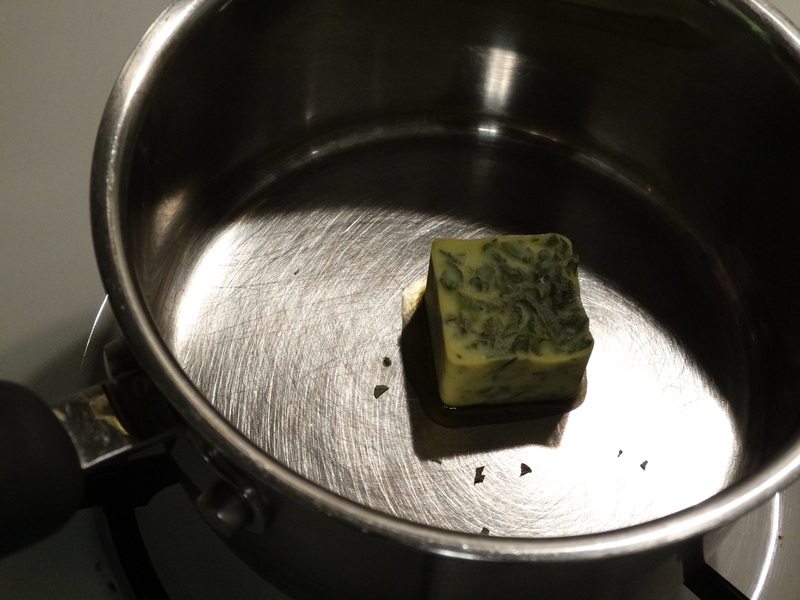 I placed one cube in a small saucepan. 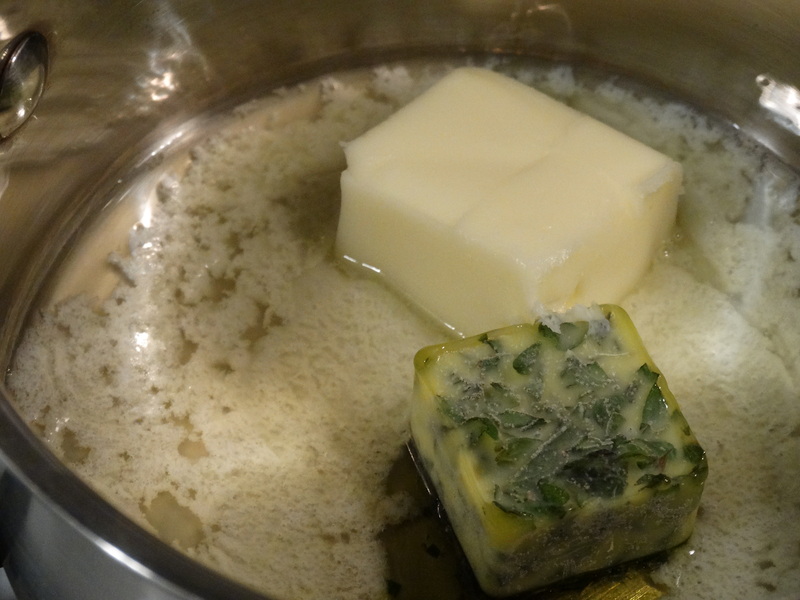 I added about a tablespoon of butter and melted them together. 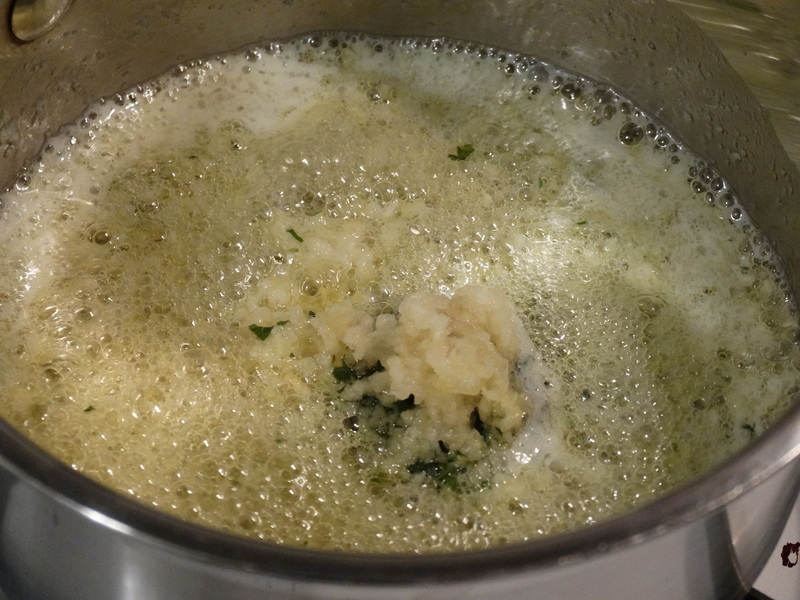 Then I tossed in some pressed garlic cloves and brought it to a low simmer for about 20 minutes. Just before spreading it over the bread, I added a tablespoon of Parmesan cheese for a little more flavor. I hope that you find this trick helpful! Not only will it shorten your prep time for future meals, but it will also prevent waste and help you save money. This is a GREAT idea! 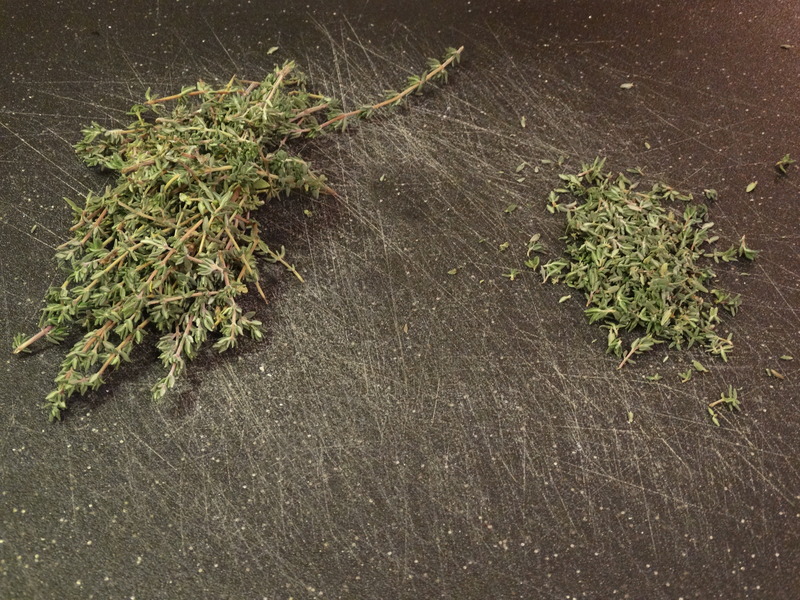 Yesterday at the grocery store, I bought fresh rosemary, dill, sage and thyme. I try to only use fresh. But I too tend to throw a lot away! I also use a bunch of flavored olive oils. (Black truffle, Tuscan herb, sage/mushroom) I’m hoping these won’t give me any trouble freezing with the chopped herbs! Thanks for the tip!